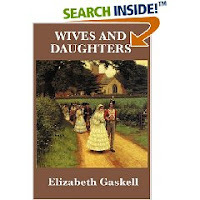 I'm reading Wives & Daughters at the (strong) recommendation of Sarah at Library Hospital. At 649 pages it seems a daunting read and there's no way I would remember all the particulars of this read without keeping a "diary" of it. This is also a book that I am reading as a part of my Fall Reading Challenge. It took me awhile to find a copy of this book. I finally found a copy at Barnes & Noble (for a cheap $7.95) which I appreciated. I purchased the book and continued to walk around the store. Some lady who had seen me buy the copy went up to my husband and asked if I was with him. She wanted to let him know, in case he wanted to let me know, how the book concludes with the author. I already knew the information she thought it her duty to share but I was completely dumbstruck that a complete stranger would walk up and tell you how the book you just purchased ended. Granted, she told my husband. But why? Why? WHY? Never, never do that, people! Day 1: Chapters 1-5. I was totally lost for the first three chapters. However, considering the length of the book I allotted myself 10 chapters to find out what the point of the story was and even who the main character is. It seems to be shaping up to be about a young Molly Gibson, whom I like very much but find very naive (but in a pleasant sort of way). We meet Molly when she is just a young thing, bantering back and forth with her father, Mr. Gibson, who occupies his time as a doctor. And that's about all I can say at this point. Molly has just turned 17 and I get the feeling her life is about to start. I'm interested enough to see what happens. Day 2: Chapters 6-11 I'm just SO not into this story. Mr. Gibson is getting remarried to someone he really doesn't love and she doesn't really love him back. It's a marriage of convenience that they are both happy about but there isn't any passion. I'm..........well, I'm bored. Day 3: Chapters 12-16 I dislike the new Mrs. Gibson. She's manipulative. I see parts of herself in me though (which also works at making me dislike myself). So she's real. Just pathetic. She's the epitome of the manipulative step mother who likes to pretend love for the sake of a good reputation. There's nothing admirable in that. Meanwhile Molly is trying desperately to please her new step mother and getting nowhere fast. I like Molly because she does speak truth (although meekly) and I dislike her because she is able to accomplish nothing with the truth. It's a very frustrating situation and I'm labouring through this book. Day 3: Continued, Chapters 17-21. I picked up the book again in the evening. I wasn't sure if I was feeling drawn to it or just wanted to get it all over with as soon as possible. Molly's dear friend and confident, Mrs. Hamley, has died and her step-sister has arrived from France. I like the sister - Cynthia. I think Mrs. Hamley's death helped to define and deepen Molly's character as someone who sacrificed for someone else's pain and comfort - almost without any notice given to Molly, personally, whatsoever. She has something of the mark of a saint about her. Now I know that Mrs. Hamley's (and her husband, the Squire) sons, Osborne & Roger are going to cause emotional upheaval at some point. The book hints at Cynthia having a rather mysterious past with some secret afoot. Perhaps I flatter myself but I think the book is predictable enough at this point for me to have a pretty good guess at how certain relationships between the characters play out. Time will tell. At any rate, the story has picked up by now (page 245) and I rather don't wish to set it down. But I must sleep sometime! Day 4: Chapters 22-27 Is anything of significance ever going to happen in this story?! I'm now officially half way through (or so it looks) and thus far it's pretty much "just a normal day in the life of . . . " ? Anyone, really. Molly? Cynthia? Mrs. Gibson? Osborne? Roger? WHO!? Day 5: Chapters 28-32 Molly is in love but won't admit it. She doesn't like her step-mother's way of telling half-truths to suit herself but won't say anything. She doesn't like Cynthia's secrecy and self-pity but won't force the issue. Osborne is a ninny. Roger is a blind idiot. I'm dying with desire to finish this book. BTW, I also definitely flattered myself. I'm clueless as to where things are going with Cynthia and I cannot guess the end of the story. Day 6: Chapters 33-42 We. are. getting. somewhere. Dr. Gibson is the only one in the entire book with any sense, although his bitterness in discovering he married stupidly is going to get the better of him if he is not careful. I'm glad he has "seen the light" of his wife and step daughter's flimsy characters. It's a good literary example of "married in haste, repented in leisure." You have to feel sorry for the fellow. And since this isn't real life and only a story on a page, I half hope for a sudden illness to suddenly strike Mrs. Gibson. She reminds me very much of Mrs. Bennett in Pride & Prejudice. Only not as tolerable because she's a step mother inflicting the same sort of pain? I don't know. In the meantime, we're getting closer to discovering The Mystery That Is Cynthia. By Chapter 42 I had certainly hoped for some break through in the story - some sense that there is reason and purpose in this book. I'm glad that the end is in sight (a mere 200 pages to go!) and yet am disappointed because I know what happened to Gaskall herself. I don't think it's much of a spoiler to say so but -- I know that Gaskall died before completing this book and someone else picked up the pen on her behalf and tried to guess at her ending. I'm not sure whether or not I'll be satisfied by another author after all this trouble. I'm not saying you have to make your point in 200 pages but if you spend the first 350 dawdling about aimlessly, well . . .
Day 7: Chapters 43 - 60 THE END! I'm positively GIDDY with excitement in being done with this book. Alas, I can't even turn this into any sort of significant learning experience because I have found very little information on either the book or its author online. That's rather desturbing. So as it is, someone is going to have to explain the relevance of this book to me (and other readers) and why it's important to read. Because right now I confess to not having the foggiest notion. The BBC version is heralded as being about "the mysteries of ordinary life" and as best I can tell, that sums it up well. It is about oridinary lives doing ordinary things made mysterious when it didn't have to be. But that's 21st century frankness talking. The climax and intrigue of the book belongs to Cynthia who is selfish in that she cares little for the feelings of others and desires everyone around her to treat her in such a way that she feels loved. However, she's hardly a villian to hate - in part because of the times in which we now live. While at one time it might have been scandalous to flirt with a man, making him think that you cared more for him than you might of (and I won't say that I wouldn't like a return to those days!!!!) it's just not The Thing these days. That makes this book feel out-of-place in today's society. It would be very hard for a younger reader to understand why this book holds any significance in today's world. And I myself confess that I do not know the reason. I'm not sure I regretted reading it. Certainly I regretted the length because the characters were not thrilling enough to excite me on any level. They were ordinary. And perhaps that is the appeal. Sarah, I would still read something else that you suggested. I would. Because you are my friend. But please don't ask 600 pages of me anytime soon. (HA!) Yes, I'm still reading Bleak House with you during the month of October. I'll be keeping a diary of that read also. In the meantime, I think I shall take a break from "heavy reading" and pick up something light and fun. Wodehouse anyone!? I'm sorry to read you didn't enjoy W&D as much as I did... but then I realize while people can equally enjoy/love reading their personalities and tastes can greatly differ, so what I might love you may not and vice versa. As to W&D -- I suppose having watched the film first helped draw me into the book. I really loved the movie and thus found my way through the book rather easily. I don't know if I would have struggled had I not known where things were going. Perhaps this was cheating... but oh well. I saw the movie before I realized it was based off a novel. The sub-title of W&D is: "An every day story" -- it's by no means as dramatic as say Jane Eyre, nor as comedic as P&P, but still I found the characters rich in all their glory and their flaws. And I admit I fell in love with the love story, but then maybe that's me. As a side note, if you didn't like W&D I'm not sure you'd like Cranford. Although shorter I found it not nearly as exciting as W&D. You might, however enjoy Ruth as that has more drama. Btw, I've found several websites detailing Gaskell's life, so if you are curious about more let me know. As to why this book holds any significance in today's world... I can only say that it holds as much as any of the literature written at that time. W&D is a story of life in the 1800s and of rich characters. It's also a "coming of age" story - unlike Jane Austen and more like many of Dickens novels. Perhaps W&D is best enjoyed by those who are looking for a new story and already have read and loved the works of Dickens, Austen and even George Elliot's long Middlemarch. I applaud you for pushing through and reading to the end and not giving up before you had a chance to find out the whole story. As for Bleak House... I hope you enjoy it more, but then, I admit I've not read BH -- I only saw the miniseries and thought it was a fascinating story... so I can't promise anything. You may decide to ditch BH. Please don't hold Dickens or Gaskell against all other classics. I've found that while I might dislike one book by an author, I might love another of their works. And Bleak House isn't on your shoulders. =D I'm SO GLAD I'm reading it along with you though because I think that'll be fun and I'll get more out of it. My friend Mirlandra harped about BH. Then Bonnie, who dislikes Dickens like myself, read it and was glad of it. So . . . all that to say, I guess, that the only reason I am not enthuasiatic about W&D is because it IS "ordinary" and there isn't a lot of climaz to the story. And therefore I don't understand the relevance to today's readership. I hope that makes a little more sense as to my position. And apparently there is a biography of her by Tessa Borodetsky, but I know nothing about it. I love the diary approach. I often feel that way when I'm reading. I enjoyed the diary approach. I loved the mini-series of this, but the book sounds daunting. And that is so strange about that lady in the bookstore!